As you can hopefully tell we have put a lot of time and hard work into our new home. When Cody and I first saw this place of course we saw all the pink granny stuff everywhere, but we both knew to look past that and we both saw so much potential here. We loved how bright this home was and how high the ceilings were. We also have a double entrance to a balcony which was one of the things I fell in love with about this place. The funny thing about this home is that when I saw those photos online I said nope I'm not going there to waste my time. Thank gosh my mom and Cody told me to give it a chance because whoever took these listing pictures did such an awful job I didn't even want to come! Those pictures make the place look so small and dark both of which it is not. I am kind of glad the pictures were terrible because someone else could've snagged it away from us had they taken better photos. It has been awhile to get it all done but it is so worth it in the end. We have replaced every single light fixture, tore out the carpet and put floors throughout the entire place, changed all the baseboards, replaced every single outlet, fresh paint everywhere, changed out closet doors, and did so much more! 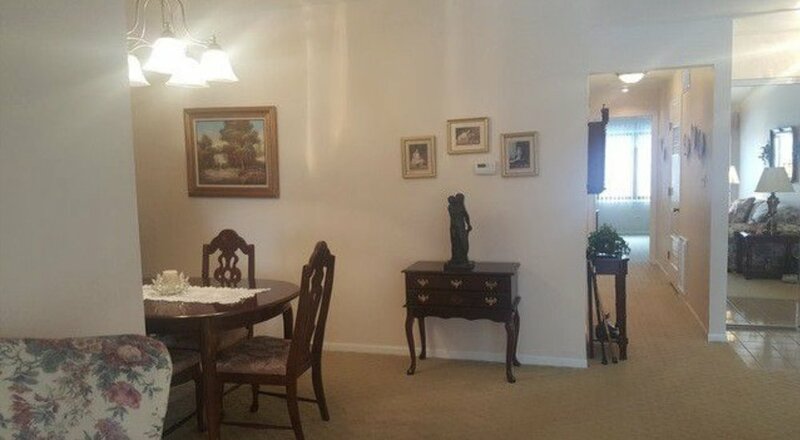 We are not yet done, I am working on a project for our dining room because as you can see it is still a little empty, but don't worry I have plans for it! We still need something to hang above the couch too we just haven't found the perfect piece yet. I didn't show you Roman's nursery as it is currently just used as storage for random stuff but we are hoping to clear it out this week and start putting together his furniture which should also be coming in within the next week or two. I'll definitely be sharing his nursery once it is done! I hope you liked this before and after post, if you like home decor related posts let me know because I love doing this stuff and can definitely do more posts like this as we settle into our home. I still have so much more to show you guys! !